The impact of commercialization and patenting pressure on genomics research is still a topic of considerable debate in academic, policy and popular literature. We interviewed genomic researchers to see if their perspectives offered fresh insights. Regional Genome Canada centers provided us with relevant researcher contact information, and in-depth structured interviews were conducted. Researcher perspectives were sharply divided, with both support and concern for commercialization regimes surfacing in interviews. Data withholding and publication delays were commonly reported, but the aggressive enforcement of patents was not. There are parallels to the Stem Cell community in Canada in these respects. Genomic researchers, as individuals directly implicated in the field of controversy, have developed varied and often novel insights which should be incorporated into the ongoing debates surrounding commercialization and patenting. Many researchers continue to raise concerns, particularly in relation to data withholding, thus emphasizing the need for a continued exploration of the complex issues associated with commercialization and patenting. Concern about the impact of commercialization pressure on the research environment can be found in both the academic and popular literature [1–4] - and for good reason. For example, there is evidence that commercial influences can increase the rate of information withholding among researchers [5–8] and encourage selective reporting of research outcomes unfavorable to industry [7, 9–13]. In addition, close links with industry can erode public trust in both the research being done and the individuals who are doing it (; for an extended discussion of the political and scientific importance of public trust, see ). There is also concern about commercialization in genetics, particularly in the context of patenting. Gene patents have come under intense criticism in the media [16–18] and in the academic community [19–22], and they have been the subject of numerous policy reports [23–25]. Surveys of the public indicate that popular opinion is also largely negative . Although recent research has reduced some of the concerns associated with gene patents [27–29], concerns remain and have, in fact, motivated calls for policy reform . Here, we seek to provide further insights regarding the perceptions of a key group of stakeholders: genomic researchers. Building on the relevant survey work that has been done in other jurisdictions [28, 29] and in other related areas of research , we conducted a series of in-depth structured interviews with leading Canadian genomics scientists on the topic of commercialization and gene patenting with the hope that their perspectives would provide fresh insights to help advance a debate that has sometimes fallen into stock arguments. We contacted regional Genome Canada centers (Genome Alberta, Genome BC, the Ontario Genomics Institute, Genome Quebec and Genome Atlantic) and asked them to provide contact information for all principal investigators, co-investigators and collaborators. Key researchers were then selected from each center on the basis of seniority and success, in approximate proportion to the relative population of the area in question. Some referrals and substitutions were made to ensure that the contacted sample was appropriately representative. Interviews were conducted by phone and responses were transcribed. A series of structured items analogous to a questionnaire were administered in order to provide a basic understanding of the demographic landscape of our sample (Additional data file 1). These items had been developed in tandem with a more traditional survey instrument on the topic of commercialization administered separately to the Stem Cell Network , which, as shown below, provides new comparative insights when paired with this study. Interspersed with these structured items were more open-ended, qualitative items, which allowed the researchers interviewed to speak at length about their outlooks on the interview topics. Although the structure guided the course of the interviews, a dialog approach was used throughout to emphasize individual perspectives. In total, 70 researchers were contacted for interview and 20 interviews (28.6%) were conducted. Of these, 14 interviews were with Genome Canada principal investigators, four with co-investigators, and two with collaborators. Respondents most frequently identified their Genome Canada-related research efforts as pertaining to human genomics (15, 75%), followed by genomics and non-human model species (five, 25%), and genomics and agriculture (three, 15%). When provided with a selection of descriptive epithets, researchers most often described their work as 'basic' (11, 55%), followed by 'translational' (eight, 40%) and 'applied' (seven, 35%). Respondents often do their work in multiple contexts, the most popular of these being university laboratories (14, 70%), followed closely by academic medical centers (12, 60%). Although it involves a relatively small sample, the goal of this study was not to provide exhaustive scope, but rather to focus in depth on a key group of stakeholders in order to survey perspectives and elicit novel insights that will help move the ongoing debate surrounding commercialization forwards. The existence of Genome Canada, as a major funder of large-scale genomic research, provided a unique opportunity to locate and engage this relatively small group. Moreover, because Genome Canada has a strong knowledge translation mandate , many of these researchers had considered these issues before they were interviewed, and had well-developed, unorthodox perspectives that emerged in their responses. Almost all the researchers surveyed stated that the most important factors motivating their research careers were high quality of research, the ability to obtain research funding, and academic integrity. Publication record and peer recognition were rated very high on the scale of importance, whereas factors such as monetary gain and the development of inventions or a patenting record were rated moderately important or not important at all. The largest group of researchers (nine, 45%) found patents to have an overall neutral impact on the research environment, seven felt that they had an overall negative impact, and four felt they had an overall positive impact (Figure 1). Driving the sentiment that patents had a negative impact was the claim that researchers may be unable to obtain permission to use patented technologies (all seven found this important or very important). Researchers were even occasionally sympathetic to the criticisms found in media coverage of the gene patent controversy; one researcher commented: "The problem with patenting biological information is that discovered mutations are patented, not just created mutations." 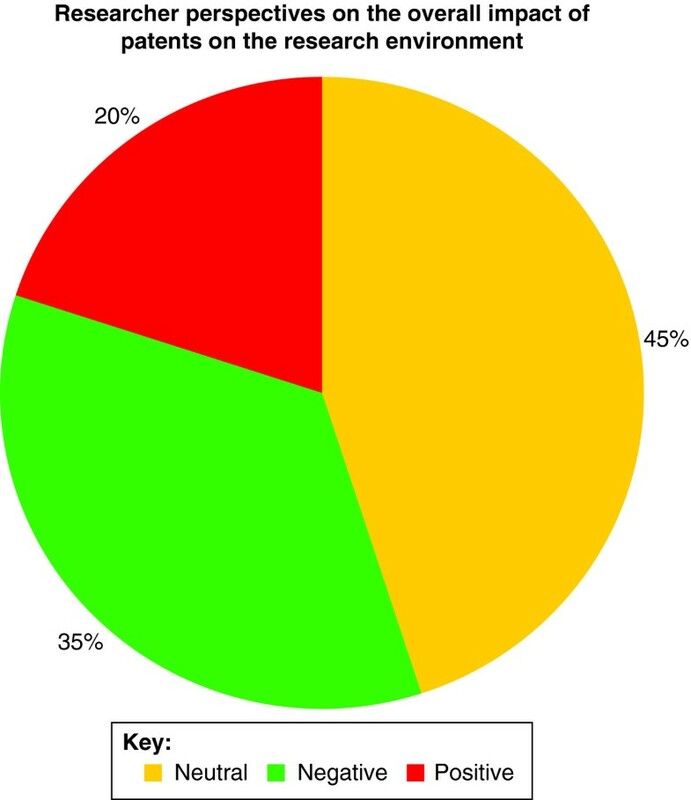 Pie chart showing the opinions of the researchers interviewed on the overall impact of patents on the research environment. Among the reasons for endorsing the use of patents, however, the reason most cited was the claim that patents facilitate development of technologies for use by society (all four of the researchers who maintained patents had a positive impact found it important or very important). One researcher suggested that patents, contrary to public opinion, might in fact have a role in the public accountability of scientists: "There are very few cases that an academic has ever seen anything in financial terms [from a patent], but if you see them as having a responsibility in their use of public funds, then patenting is crucially important for it to reach full commercial potential." Nevertheless, patenting and commercial expectation did seem to have some adverse effects. The potential to patent was perceived to have caused a delay of research results for eight researchers (40%), whereas it was said to have caused the withholding of research information for 11 researchers (55%). Respondents referred to "vague and unspecific" conference abstracts or web updates as instances of data withholding - the implication being that concern about patentability caused the withholding of more detailed information. Of those for whom it delayed publication, the most common delay was by 1-6 months (50%). This pattern did not surprise one researcher, who found the question somewhat redundant: " [Patenting] has to [cause withholding] by definition: if you go out and talk about it, it's not patentable." This is, of course, the reason that there is a concern about publication delays. Although publication delays and data withholding were acknowledged by researchers, only one researcher had refused to license patented technology to someone who approached them with a request for a license (5%), citing as a reason for refusal that "the technology would not be well used by the recipient". Similarly, only one researcher had been refused a license to a patented technology they needed for research themselves; in response, they worked around the patented technology by using alternative methods and approaches. None had ever been served a 'cease and desist' letter informing them that they had infringed a third party's intellectual property and instructing them to stop all infringing activities or face legal action. We can infer from these results that the researchers' research work itself had never been delayed much by another's patent. This was certainly not because their particular type of work did not involve patents: most researchers surveyed were involved in commercialization activities. Some 65% of researchers had, at some point, needed to access patented technology from another party, and exactly half of the researchers interviewed had themselves been named as inventor on granted patents or on pending patent applications. All of those who had been named on a granted patent (including pending patent applications) had negotiated license agreements to permit others to use their technology, most often with private companies. Overall, 13 researchers maintained that the pressure that they are currently under to commercialize is reasonable, and five held that it is unreasonable. Two researchers declined to respond. One said: "It is reasonable under the circumstances but I don't like the circumstances." Another respondent insisted that commercialization pressure helps to boost researcher morale, providing as it does a "real application" for the research that is being done, and thus improving work. When researchers were given the opportunity to speak openly on the issue of commercialization, interesting and fresh perspectives consistently emerged. It might be, volunteered one researcher, that popular concern is not so much over commercialization per se as it is over commercial timelines: "The discovery horizon is much further beyond the commercial horizon. The commercial horizon is to make money within 3-5 years, but the discovery horizon is 8-10. So [the goal should be to make] pressure for commercialization more commensurate with the discovery horizon." Similarly, a different researcher speculated that many of the problems people supposedly have with commercialization are in fact problems with inefficient technology transfer offices (TTOs). "If you could promise a week turnaround time from a TTO, you would find that virtually no-one was complaining about delays." An older researcher, however, claimed that, despite all reports of a paradigm shift, things have not changed much in the past few decades: "All money comes with strings, whether it's a requirement to succeed scientifically or [to help produce] commercial success." Both requirements from this perspective could arguably produce problems. Another respondent suggested that there is still a disconnect between the rhetoric surrounding commercialization and its actual implementation in the laboratory setting, reflected in the fact that hiring standards are still overwhelmingly focused on publication record: "The academic ideal has always been not to pay attention to commercialization." A different respondent complained that trying to teach students to be good scientists in today's environment is difficult, because idealistic lessons in scientific integrity are always contrasted with the realities of the commercial world, where one finds "exactly the opposite". Still another argued that, whether pressures were currently seen as reasonable or unreasonable, commercialization is here to stay, and the laboratory had best adapt to it, contending that it would be "mythological to think that we will have a large body of new knowledge that will be freely available." It is clear that the opinions of researchers on this topic are sharply divided, and our interviews were a fruitful exploration of these perspectives. Significantly, aside from evidence of data withholding and delayed publication, the interviews uncovered few concrete negative experiences or anecdotes caused by commercialization. This finding is in keeping with much of the most recent research on the topic [28, 29] and is also remarkably similar to the results of a similarly structured survey we administered to the broad membership of the Stem Cell Network . The stem-cell community and the genomics research community, though both working in the face of controversy surrounding emerging technologies, face very different issues, and it is not at all clear that results from the two communities on similar issues would be similar. The fact that they are similar is noteworthy. In our study and other recent research [28–30], much concern is expressed about commercialization and patents, but little is said to suggest that the progress of research itself is in fact being seriously hindered. Likewise, there is little evidence that gene patents are being aggressively enforced - as evidenced by the fact that this group of very active researchers has had almost no exposure to the enforcement of patent rights (again, this is consistent with other literature ). The area of data withholding deserves further investigation, as this has been consistently identified as an issue [1, 6] and our research provides some tentative support for its existence. However, other research has found that other factors, such as academic competitiveness, may be a more pronounced source of data withholding behavior . These interviews are exploratory in nature and, of course, the approach has limitations. Interviews of this nature are measurements only of perspective, and even then only of a small sample size. But the window they provide into these often neglected outlooks is valuable. It should also be noted that because Genome Canada has a strong interest in knowledge translation through commercialization , this group of researchers, by holding a Genome Canada grant, might be viewed (correctly or incorrectly) as having a bias toward a commercialization ethos. Although this should be considered in the interpretation of our results, it is worth noting that despite this potential bias, we still found a remarkably diverse spectrum of views. The commercialization of the research environment continues to stir debate. The degree to which commercial interests influence outcomes, reporting, the teaching environment and scientific integrity in the area of genomic research thus deserves further scrutiny. As one respondent suggested, the apparent lack of pejorative data on commercialization might reflect more the structure and timing of the research itself than the landscape of genomics research: "Most researchers don't think about the questions that you're asking until they try to move the technology into the private sector. Universities are developing commercialization offices and want researchers to do this. The results of [these kind of investigations] are going to make it look like everything is hunky-dory when in fact it isn't." The following additional data is available. Additional data file 1 contains the structured interview instrument, which was administered to all respondents. We thank Robyn Hyde-Lay and Lori Sheremeta for help in the early stages of this study and Genome Alberta for support. The authors received funding for this project from Genome Alberta. CM participated in the design and coordination of the study, conducted the interviews, performed the statistical analysis and helped to draft the manuscript. TC conceived the study, participated in its design and coordination and helped to draft the manuscript. Both authors read and approved the final manuscript.